For the idiots in marketing who think lesser known cities in India don't have wealth and so shouldn't be on their radar, the Aurangabad-Merc story will come as a shock. Well, its better late then never, so there's still hope in tapping into such small town wealth. 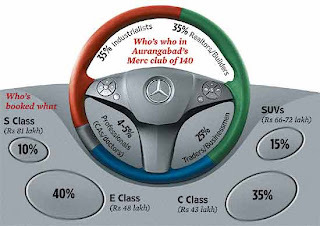 Read about Aurangabad's Merc club of 140 here. pun intended - "fortune lies at the bottom of the pyramid"